A good panini press is a must-have for any kitchen. Here are a few of my favorites. If someone asked me what small appliance is used most in my home, it would undoubtedly be my panini press. That is saying a lot because I spend a lot of time cooking. Our panini press is used at least once every day (and some days multiple times). It allows my kids to prepare foods on their own that I wouldn’t be comfortable letting them do on the stovetop or in the oven. They feel a sense of independence and it saves me time; what could be better? Why Buy a Panini Press? Originally Italian, Paninis became popular in New York in the 1970s and 80s and quickly spread to other cities throughout the U.S.
Now you can find a panini press not only in many restaurants but also in people’s homes. What makes a panini press so popular? It allows you to take fresh ingredients and make an amazing meal in a very short amount of time. A few years ago we were at my parents’ house and used their new panini press. I was so impressed by it that I went right home and ordered one. I admit I don’t know how I lived without one (and I don’t plan to live without one again)! 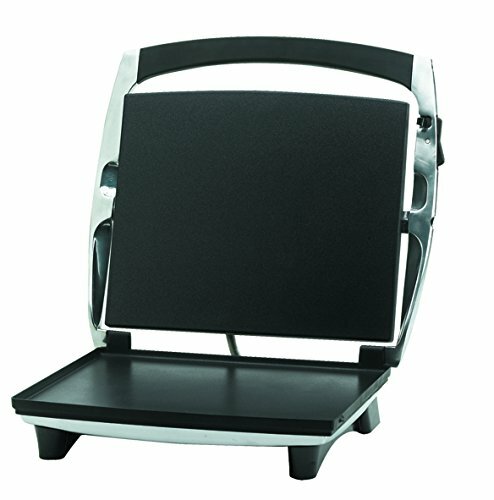 Not all panini presses or sandwich makers are created equal. Some machines are only for sandwiches, while others can cook a variety of different foods. Some have removable plates. Some have ridged plates which leave grill marks while others have flat plates. Which one is right for you? Most of these panini presses are under $50. • Non-stick plates: This allows you to cook without your sandwich sticking to the machine and creating a big mess. It also makes clean up quick and easy. • Power and ready lights: These lights tell you when the machine is heated up and when your food is finished cooking. All of the machines listed in this article have these lights. • Non-removable plates: This is debatable. I have owned a sandwich maker with removable plates, and they would fall off during cooking—believe me, it’s not what you want. I have yet to find a sandwich maker with removable plates that I would choose to use. You can be your own judge on that. • Floating lid: This is a must in a panini press. It allows the lid to move up or down, depending on how thick your sandwich or food is. Without a floating lid, you end up with either a completely smashed, paper-thin sandwich or one that isn’t cooked through. • Versatility: I don’t like having to own a dozen different small appliances. It is nice having a machine that can cook a variety of different foods. 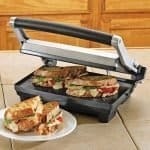 I have found my five favorite panini presses/sandwich makers. 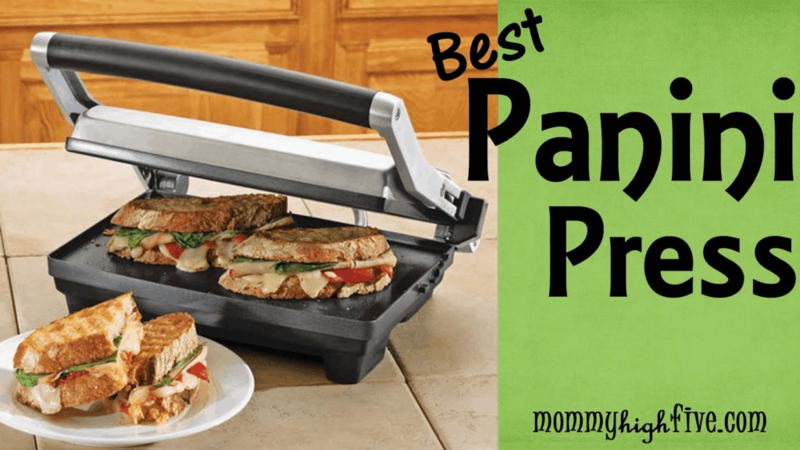 Here are my top picks for the best panini presses of 2019. 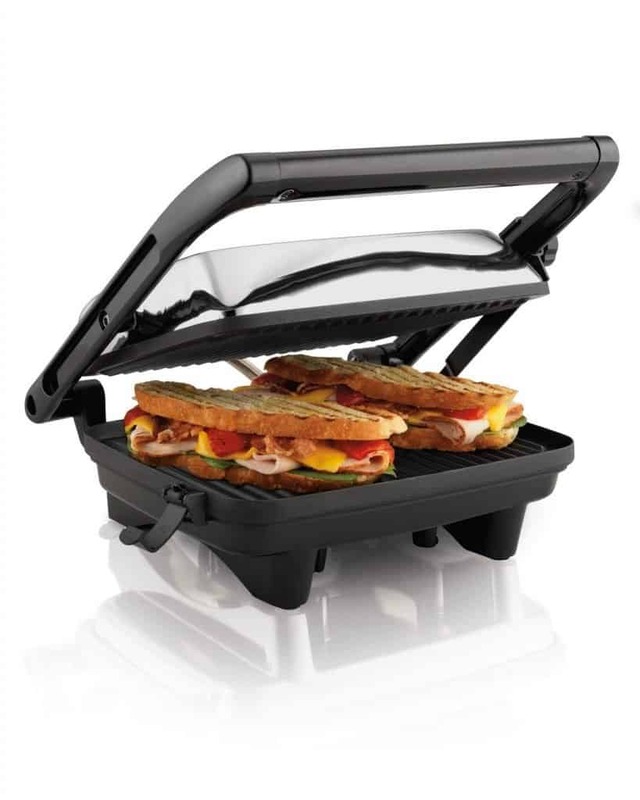 The Panini Dual from Breville is ideal for making sandwiches. This Breville panini press is everything you would expect from Breville—quality and great performance. Yes, this machine is slightly more expensive than most of the others on this list. However, if you are looking for lasting, good performance, this is the machine for you. Unlike other panini presses, this one has a flat bottom plate and a ridged top plate. 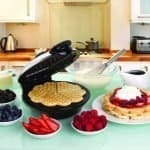 That means you can use the bottom plate as a griddle to cook foods like pancakes, eggs, or French toast. The top plate gives you great grill marks for your sandwich. The floating hinge allows you to cook sandwiches of any thickness. It will cook your sandwiches evenly. The cooking plates are not removable, but they are easy to clean. This machine can be stored upright. It comes with a 1-year limited warranty. I use this panini maker for eggs, hash browns, and a variety of other foods. 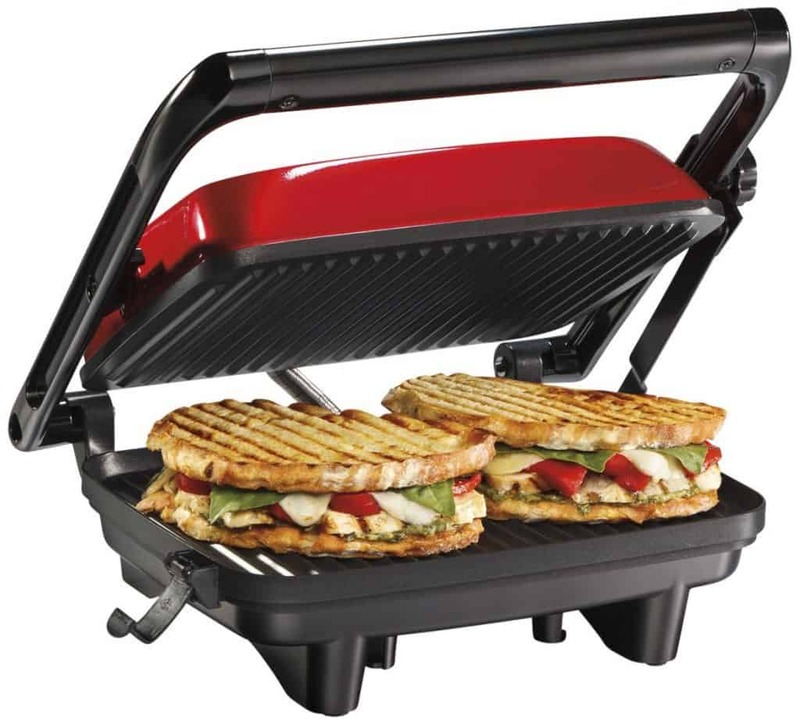 If you are looking for a versatile panini maker, this is the one for you. Not only does it make great sandwiches, the flat plates are also great for cooking a variety of other foods including eggs and hash browns. 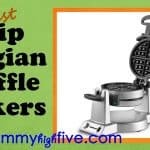 My kids love eggs cooked on the machine and I love that they can use it safely along with our character and traditional waffle makers. Simply spray the panini maker with cooking spray, crack an egg on the plate, close the lid, and wait 10 seconds.You get a delicious egg in no time. We also use this machine to make quick, delicious omelets. Another bonus of this panini maker is that it is so easy to clean. Simply wipe off the plates and you are good to go. The stainless steel exterior is easy to clean as well. If you want an affordable panini maker with removable plates, this is the one I’d recommend. This is another versatile machine. It opens flat so you can use it as a grill. 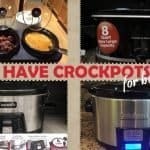 You can use it to cook sandwiches, burgers, or steaks. This machine comes with a grease tray to make your cooking experience less messy. 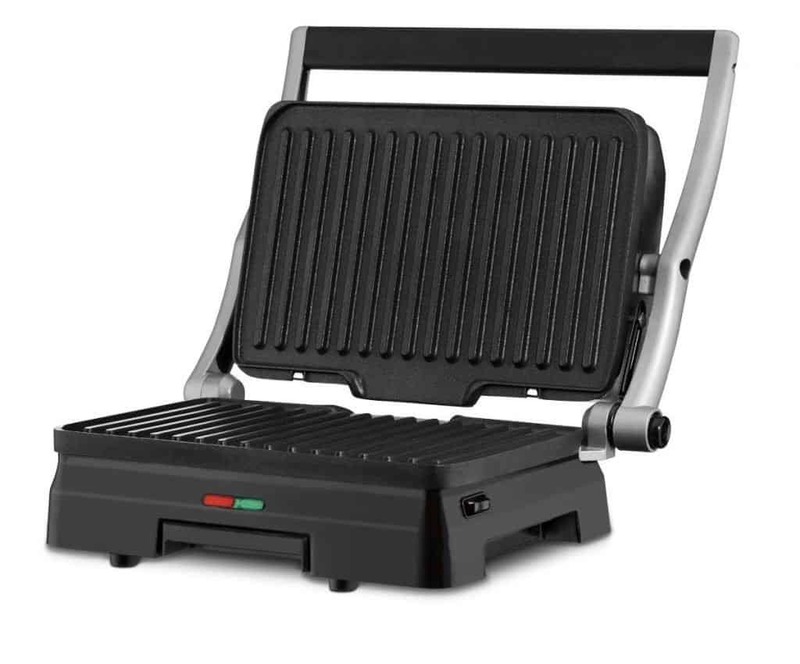 The Cuisinart GR-11 Griddler 3-in-1 Grill and Panini Press has removable, dishwasher-safe cooking plates. Just be warned, while this machine does a great job cooking, some users have noted that the plates come unattached from the rest of the machine during cooking. In my book, being able to remove the plates for cleaning is not worth the possibility of the machine falling apart while I am cooking. 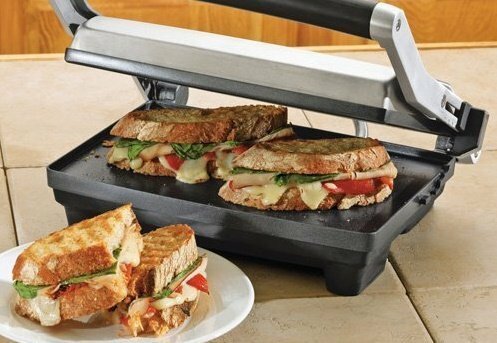 This panini press is a great value. It contains a floating lid, which allows you to cook sandwiches of varying thickness. A preheat light lets you know when the machine has reached the correct temperature. 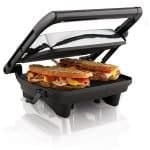 Additionally, the Hamilton Beach 25460A Panini Press Gourmet Sandwich Maker can be stored upright, which saves on storage space. The grill plates are not removable, but they are easy to wipe clean. This machine is smaller than many of the others on this list, but it is an excellent machine for the money. If price is your biggest concern, this is the machine for you. It will make a good panini. 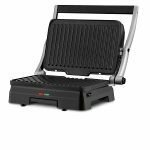 This machine is good at grilling sandwiches, but unlike other machines on this list, the Hamilton Beach 25462Z Panini Press Gourmet Sandwich Maker cannot make other foods. It does have a floating lid which allows you to cook sandwiches of any thickness. This panini press is smaller than many of the others on this list. However, it does have the capability of being stored upright, saving you space. This machine is not likely to last more than a couple years at the most. If you want a serious machine, I recommend the Breville or the IMUSA. 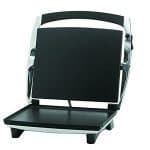 So which Panini Press or Sandwich Maker to buy? If you’re like me, having a panini press or sandwich maker will be a life changer. Do yourself a favor and go with the best one you can afford on this list. The Breville and the IMUSA are sure to exceed your expectations. If you’re not sure about it or if your budget won’t allow one for of these, go with one of the Hamilton Beach models and save your pennies for a fancier one in the future! 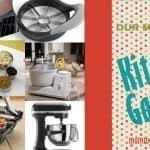 For more be sure to check out our post on the best kitchen gadgets.